Illimani, from the road to Pinaya. 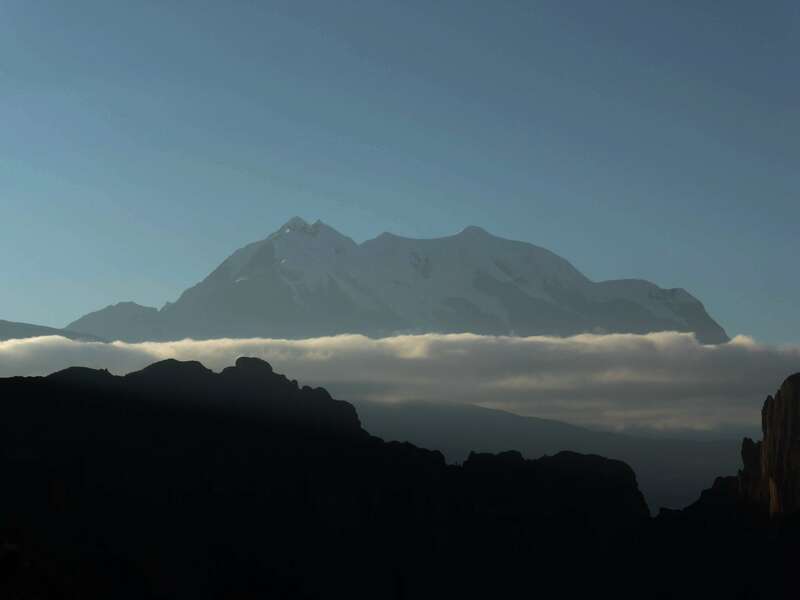 At 6438m Illimani stands as Bolivia’s second highest, and one of the country’s most beautiful peaks. Seen from nearby La Paz Illimani seems small and close, but in reality is awe inspiringly massive, with five distinct summits. 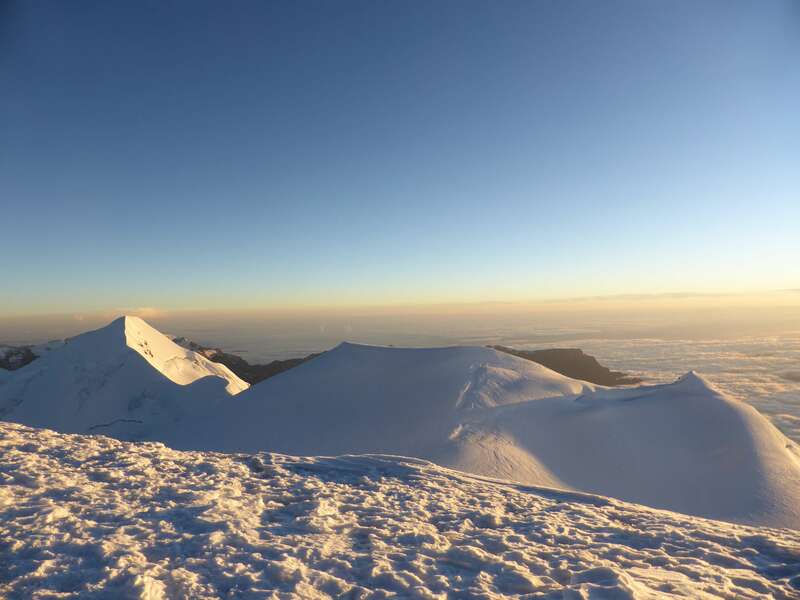 Illimani’s south summit is the mountain’s high point and is accessed by the standard western climbing route. 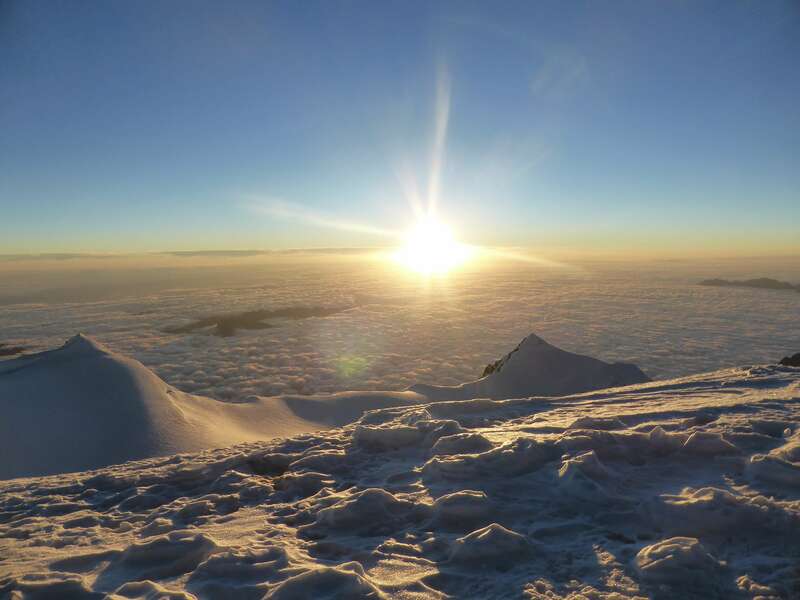 Mururata (left) and Illimani (right) at sunrise, from the summit of Huayna Potosi. 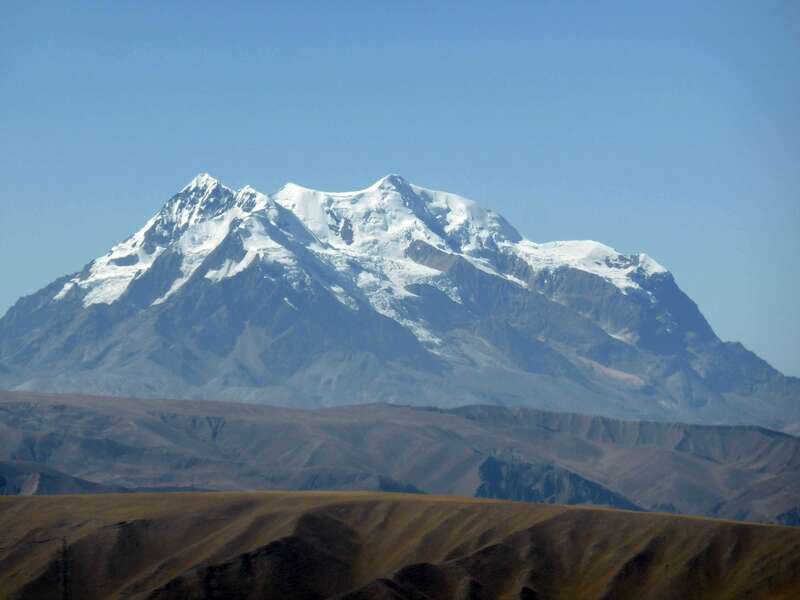 Illimani was one of my primary climbing goals in visiting Bolivia, and the last peak which I would attempt on my trip. Prior to Illimani I had spent a good amount of time camping at altitudes of around ~4500m, and had climbed 6088m Huayna Potosi just a few days earlier. Thoroughly acclimatized and having performed well physically during my other climbs, albeit not feeling perfect due to recent food poisoning, my guide Eduardo and I planned to make the climb overnight, spending just a few hours resting at a high camp. Day 1: Eduardo met me at my Hostel in La Paz early in the morning, and after a fast breakfast we began the long drive to the village of Pinaya. From La Paz the route took us around four hours, first across the city, and then along a dirt road through a scenic valley. The mountain could be seen ahead of us throughout the drive, and its features slowly began to take on definition as we grew closer. Illimani in the distance, from the road to Pinaya. We arrived in Pinaya before noon, and stopped in the central square nearby the schoolhouse. Pinaya is a rural village, and very small. In Pinaya we hired two locals to work as porters to help us carry gear to high camp. They hopped into the truck with us, and we continued to drive upwards along a narrow and dilapidated dirt road. I typically feel uncomfortable at the idea of using the service of porters, but our climbing plan involved a same-day summit push for which we needed to be fully energized. This would be my first experience employing porters, and after the fact I am still unsure regarding the ethics of having other people haul gear for you. My mentality stands that a climber should be capable of managing their own gear and climbing under their own power. 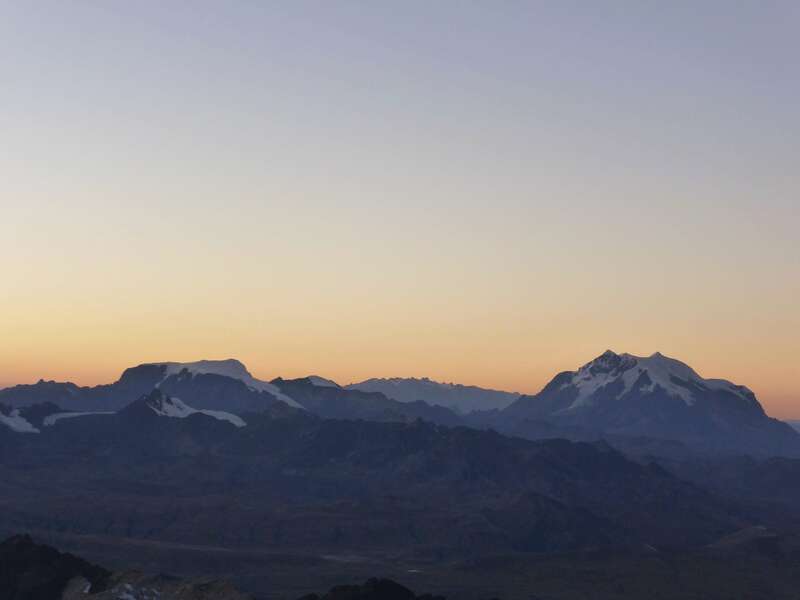 In the case of Illimani, the effort of our porters moving gear to high camp was a factor in enabling us to climb Illimani over a single night, rather than following the traditional three or four day schedule. 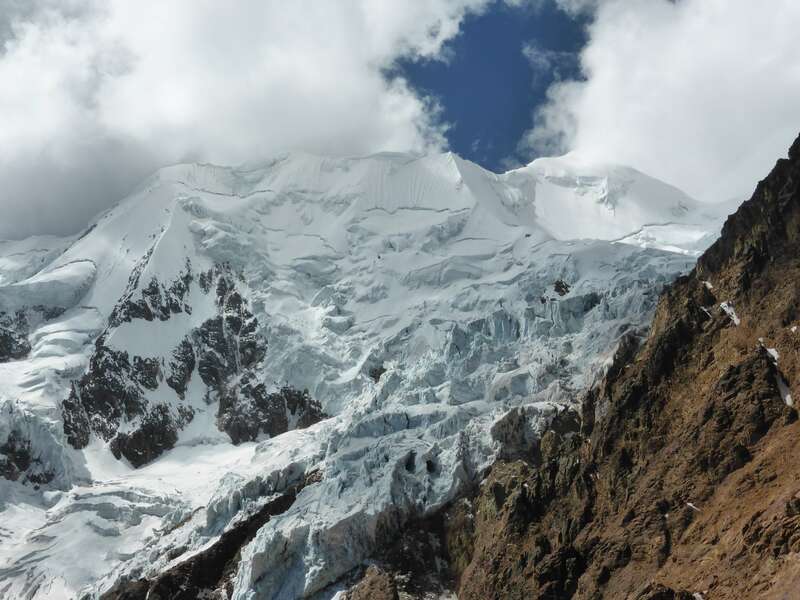 The locals in Pinaya greatly benefit from the arrangement, and make a high wage for a day’s work assisting climbers. After some 45 minutes of rough driving out of Pinaya we reached Puente Roto, a large grass covered field and the base camp for Illimani. Here we sorted out equipment, had a quick lunch in the car, and at 12:15 p.m. began hiking upwards along a path of scree. The lower slopes of Illimani. The route to high camp traverses numerous scree fields and large swathes of smooth rock ground down over time by ancient glacial movement. Several runoff streams cut across the path, and distant waterfalls can be heard along the route. 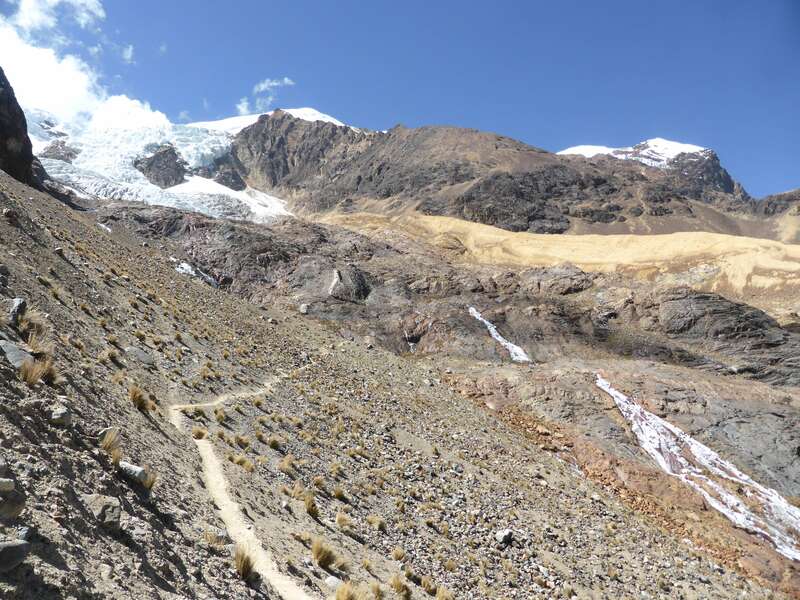 Illimani’s glacier has receded considerably, and as we hiked Eduardo shared stories of the Illimani he remembered from his youth, when the glacier covered most of the now-barren lower slopes. The views grew increasingly impressive as we moved upwards, and I began to appreciate how absolutely enormous a mountain Illimani is. The lower glaciers of Illimani. View of the glacier from the high camp approach hike. 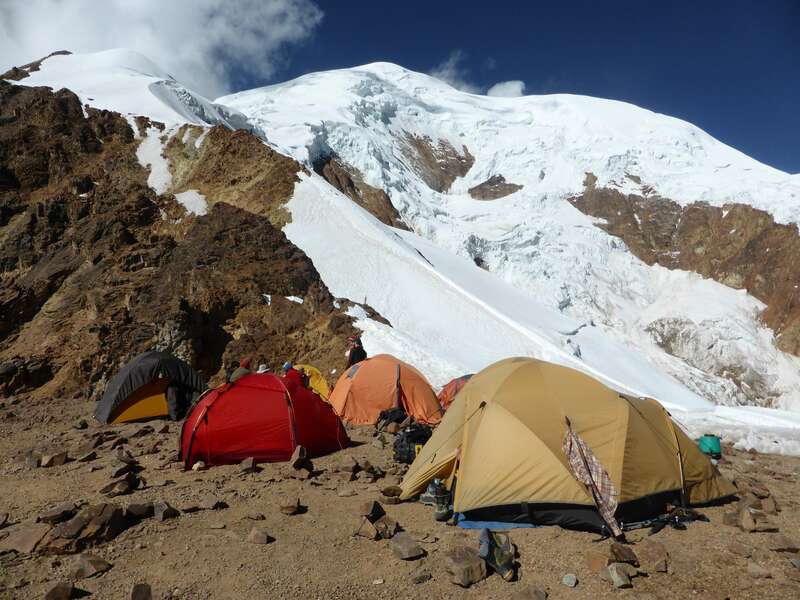 At exactly 4:00 p.m. we arrived at 5500m Nido de Condores, “The Condor’s Nest”, a small rocky outcrop and the high camp for Illimani’s normal route. Here we quickly pitched our tents and settled in for an afternoon of rest and hydration. 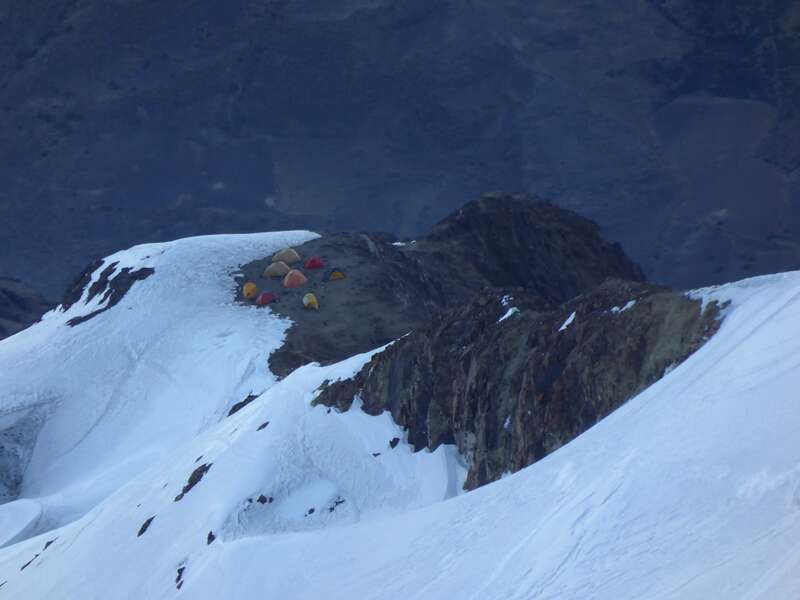 We were not alone at high camp, and three other groups were also preparing for a summit attempt. After a light dinner, I went to sleep early. My one-person tent at Nido de Condores. The south summit, not visible, lies beyond the false-summit in this photograph, to the climber’s right from Nido de Condores. Day 2: Awake around 1 a.m., Eduardo and I began climbing upwards at 2:20 a.m. We roped up almost immediately after leaving camp. 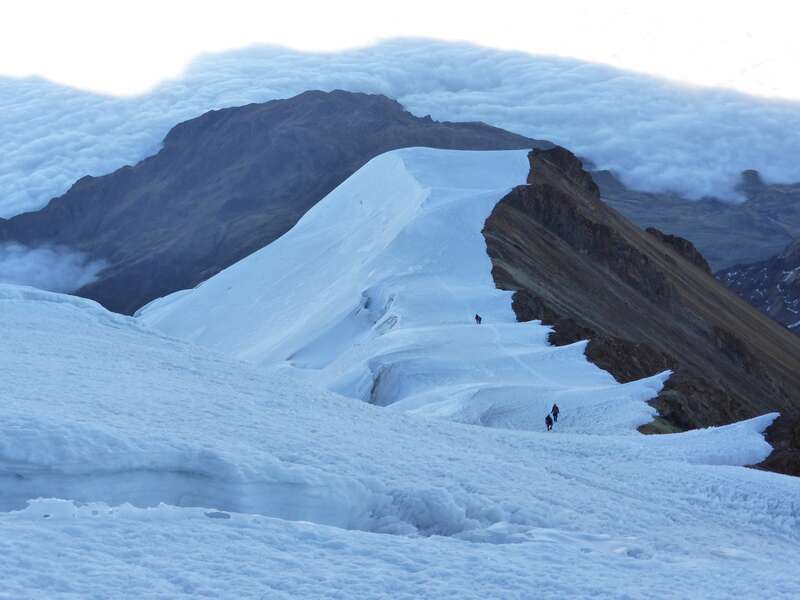 While Illimani’s normal route is not particularly steep or technical, with a maximum slope of around 50 degrees, it does follow several ridges exposed to sheer drop-offs where a fall would be difficult to arrest. Starting steady and strong, passing another group within the first hour, some three hours into the climb I felt myself flagging mentally. The snow condition was good, the wind cold but manageable. Despite fairly unpleasant stomach issues two days earlier my breathing was steady and controlled, my legs and body mechanically driving upwards without serious fatigue, but my thoughts drifted. When I considered the summit I felt empty. The altitude weighed on me and I felt lethargic, completely unmotivated. My pace slowed us down, and a group of four passed us. I began to consciously question my purpose, the rationale behind each step upwards. We pressed on, stopping occasionally for water breaks. The sky above us began to take on a faint glow, as sunrise bloomed on the other side of the mountain. 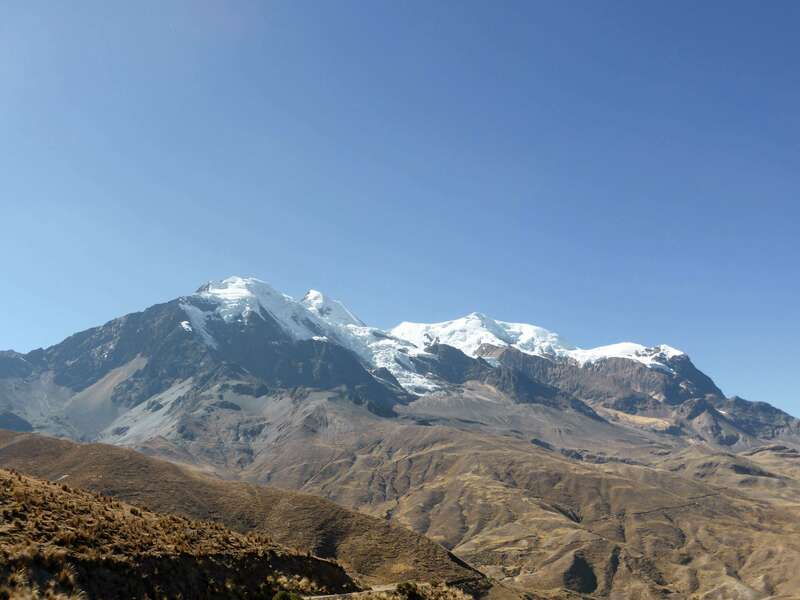 Illimani is a notoriously cold climb chiefly due to its standard route taking a western approach, shaded from the sun until relatively late in the morning, and compounded by the mountain’s prominence and exposure to wind. As the sky brightened and cast textured shadows onto the snow underfoot we crested a false summit, and ahead of us could see the team of four climbing the final ridge to the south summit and highpoint. Eduardo and I reached the summit at 6:50 a.m., four and a half hours after leaving camp. While a ‘normal’ time for this route is 5-7 hours, my climb felt sluggish and not particularly efficient. I was happy to stand atop Illimani, but my mind did not register a sense of accomplishment. The north and central summits of Illimani in the distance. 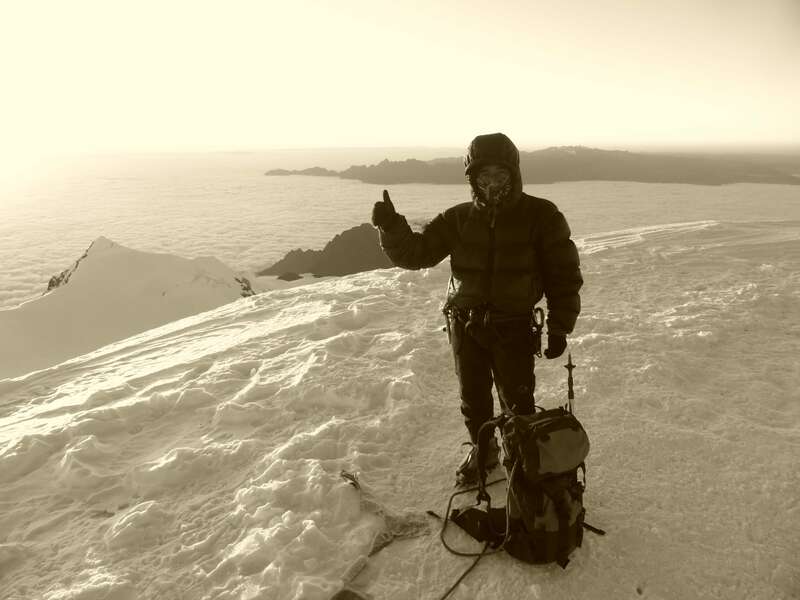 Eduardo on the summit of Illimani. 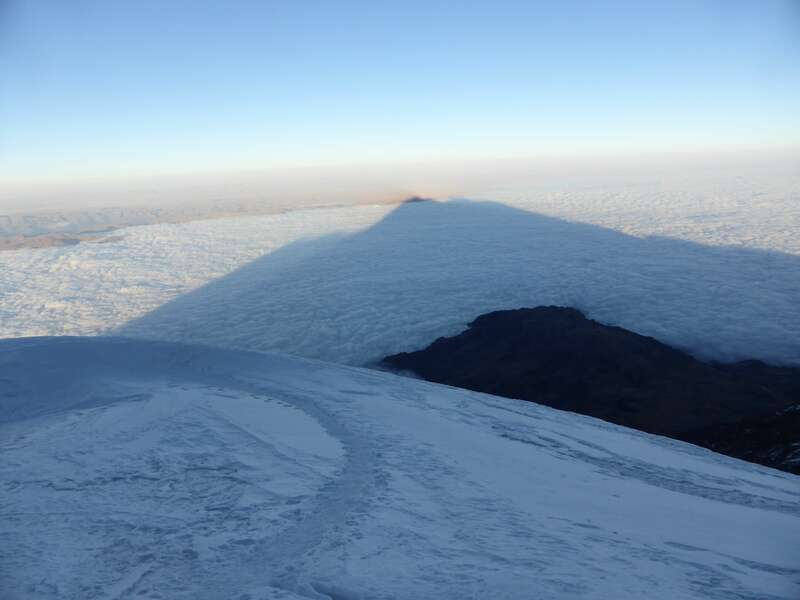 Illimani’s shadow stretched out far below us. After some twenty minutes on the summit Eduardo and I began to head back down. The descent was fast and the route clear to follow in daylight. We encountered another team still ascending and wished them good luck. The fourth team on the mountain, a Mexican group who had shared camp with us, had turned around. 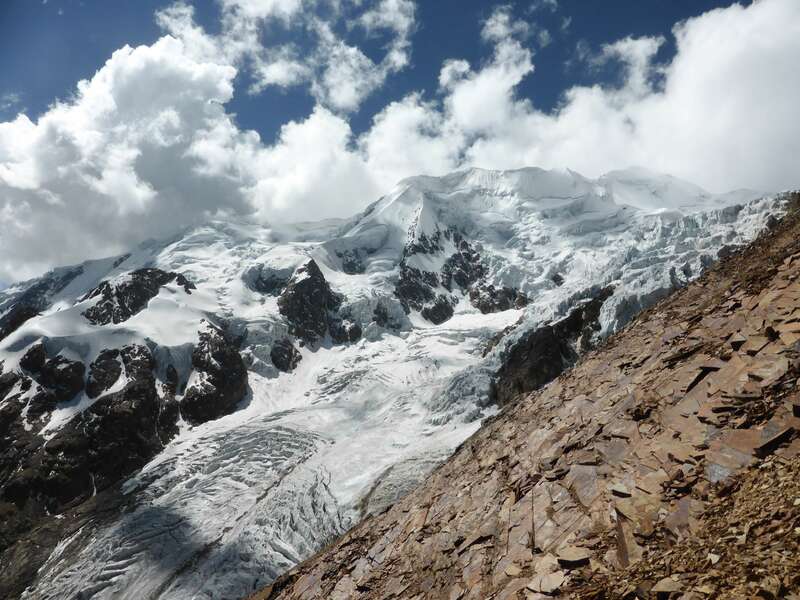 They would later tell me that their pace was too slow, and thus the climb too cold, perhaps too fatigued from their gear haul to high camp earlier in the day. Nido de Condores quickly came into sight below us, my tent a tiny spot of color. Nido de Condores, center of the picture, at the left end of the ridge. Descending the final ridge to high camp, the team of four ahead of us. We reached camp at 9:00 a.m., having descended from the summit in under two hours. I took an hour to nap in my tent before rising to pack up gear and prepare for our descent to Puente Roto and the truck. The drive back to La Paz was long and uneventful, but the mountain rose behind us the entire way, tall and surreal, making it difficult to believe that we had stood upon its summit just hours earlier. Looking back at Illimani during the approach hike. Illimani above the clouds, from the valley road to Pinaya. Illimani is an enormous and aesthetically attractive mountain. Weather during the climbing season in Bolivia is typically very stable, and I enjoyed clear skies during the night of our ascent. Moderate wind resulted in a cold climb, but my gear and pace were up to the conditions. While high altitude made physical output strenuous and tiring, and could perhaps be entirely to blame for my apathetic mental state, the climb did not otherwise feel particularly difficult. 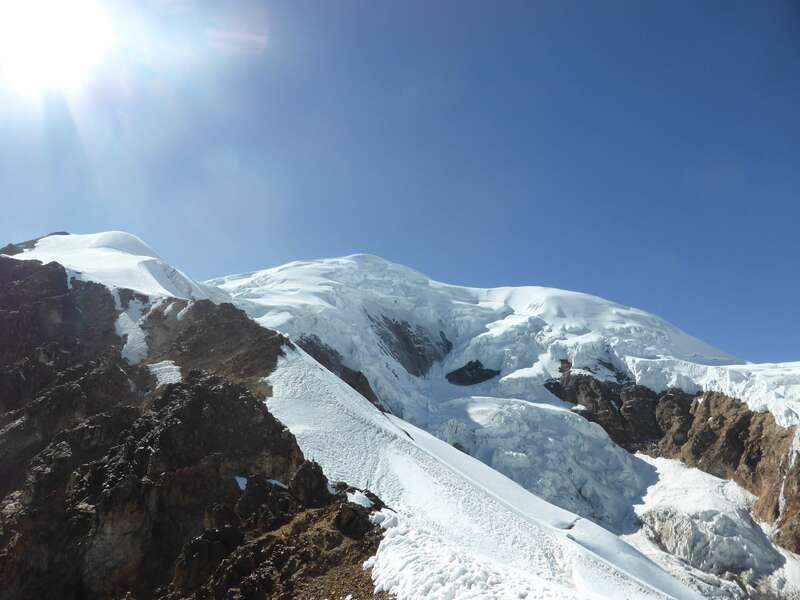 Indeed, I would argue that the bergschrund and summit ridge of Huayna Potosi several days earlier posed greater challenges than anything I encountered on Illimani. The lack of mental focus which I encountered on Illimani was a first experience for me, and in hindsight serves as a motivation for better commitment and emotional investment into future climbs. I had an excellent experience in Bolivia, and intend to visit again. While I ‘only’ climbed five of the country’s peaks, all popular trade routes, I was very pleased to manage two overnight 6000 meter summits and a fun unroped ascent of Pequeno Alpamayo. 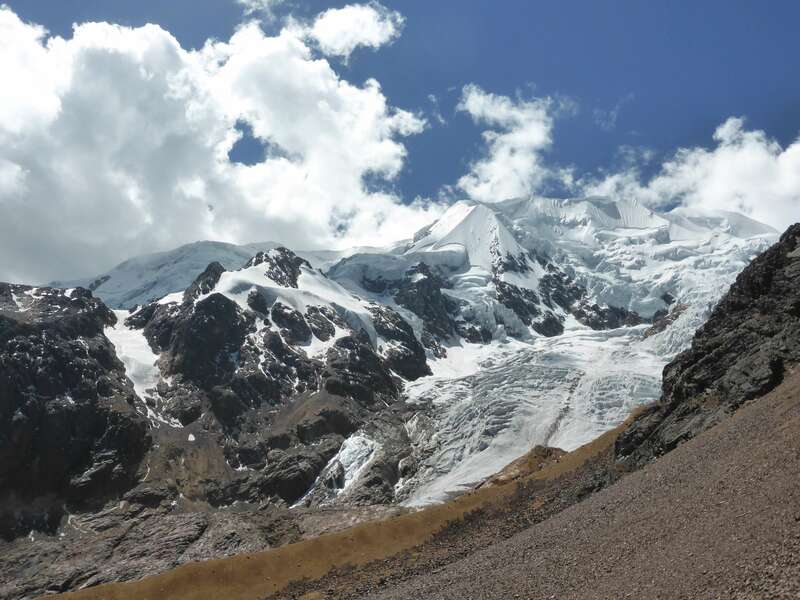 Illimani is one of Bolivia’s more popular climbs, and numerous support agencies offer transport, logistics, and guiding services for the mountain. 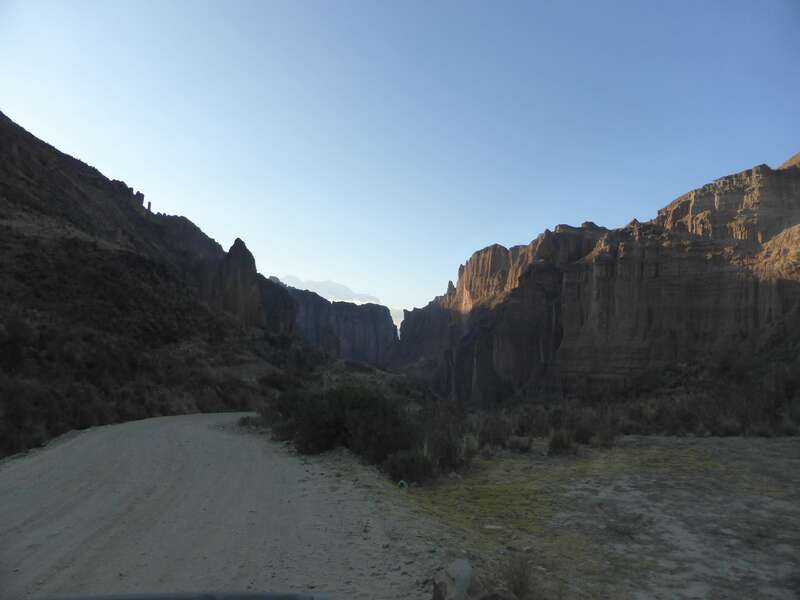 The largest hurdle in accessibility is the lengthy and involved drive to basecamp, taking some ~4 hours from downtown La Paz. Eduardo and I rode in his 4×4, but chartered vehicles for unguided climbers can also be hired from outfitting companies. 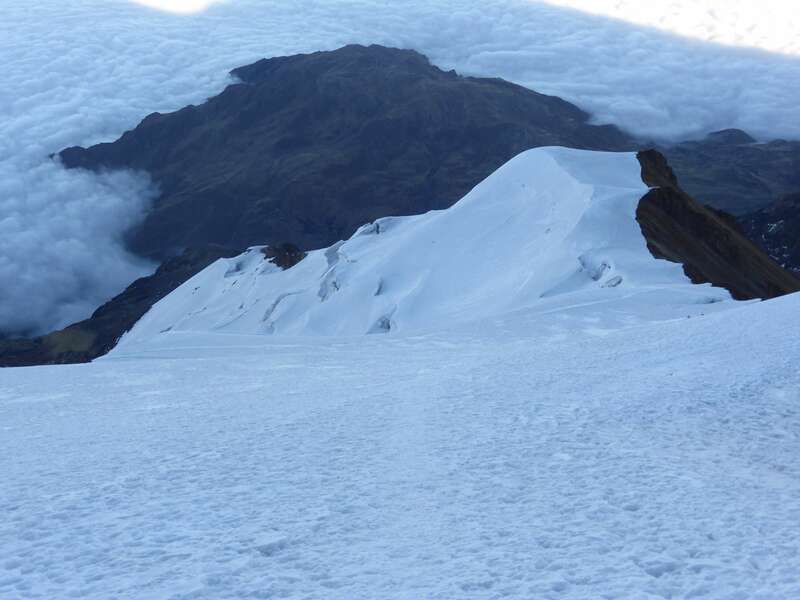 There are no permit or access fees associated with climbing Illimani. At over 6000m, Illimani is a high altitude climb. Adequate acclimatization is of critical importance to a safe and successful climb. 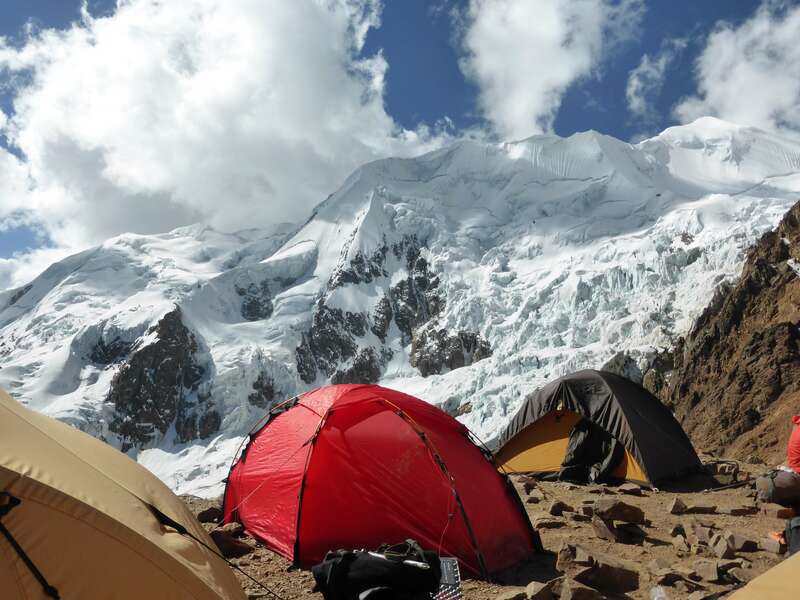 I acclimatized by spending extra time in La Paz, by hiking and climbing in the nearby Condoriri group of mountains, and through a fast overnight ascent of 6088m Huayna Potosi. I started climbing Illimani after spending over a week at high altitudes. For logistics and a 1:1 guide I used the services of Eduardo Mamani and his company http://www.bolivianmountainguides.com/. During my trip I climbed with Eduardo himself, as well as with his brother Gregorio and nephew Pedro. All three are certified UIAGM / IFMGA guides, are exceptionally strong, professional, and personable. Eduardo and Gregorio have been climbing in Bolivia for decades, and have an astonishing amount of experience and knowledge. I highly recommend their services. When I return to Bolivia I will, without doubt, contact them again. 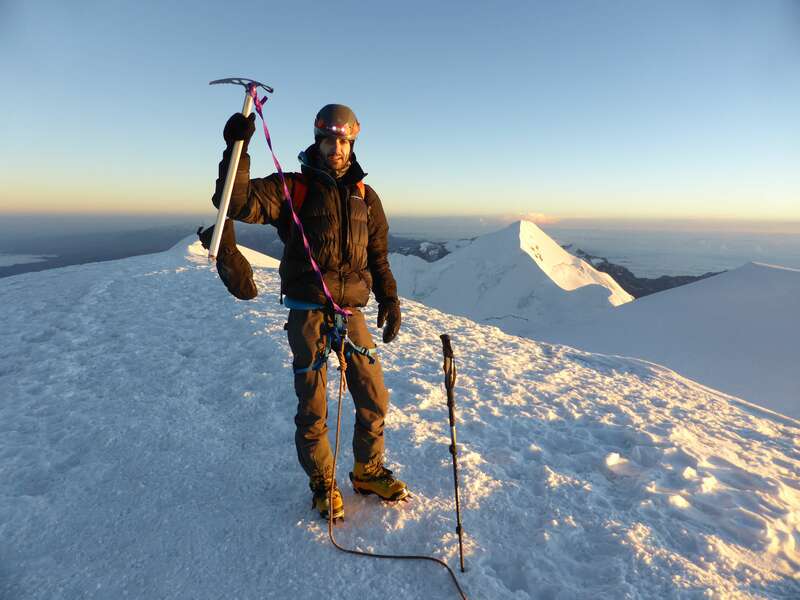 This entry was posted in Bolivia, Mountaineering and tagged Huayna Potosi, Illimani, Nido de Condores, Pinaya by Ian. Bookmark the permalink.